Located in Wilkinsburg, Nancy’s Revival is an informal booth-&-counter joint offering homestyle American lunch & breakfast options. Established in 1976 by the Bielicki family, Nancy’s East End Diner has withstood the test of time by serving up classic diner eats with a smile. Opening in the midst of Pittsburgh’s disappearing steel industry, Nancy’s became a local meeting spot for Wilkinsburg’s declining population in the 80’s and 90’s. Serving a diverse group of hungry patrons, the love for Nancy and the Bielicki family is still visible today by the photos that hang on the wall. 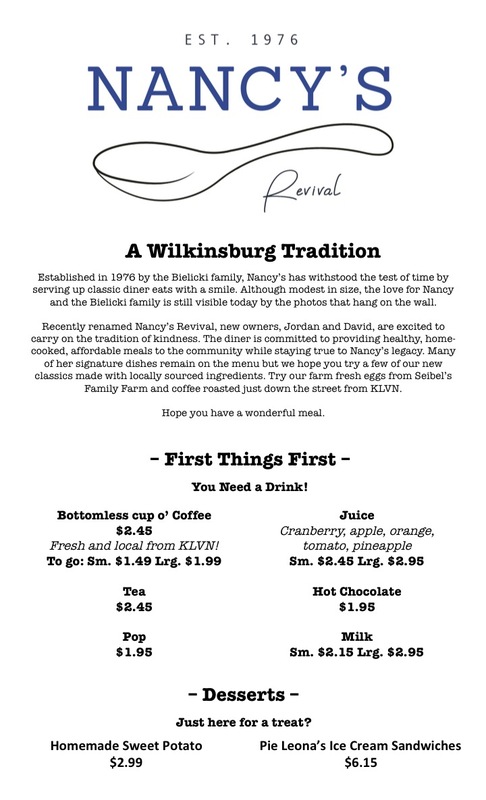 Recently renamed Nancy’s Revival, new owners, Jordan and David, are excited to be part of Wilkinsburg’s ever growing resurgence. The diner is committed to providing healthy, home-cooked, affordable meals to the community while staying true to Nancy’s legacy. Many of her signature dishes remain on the menu but we hope you try a few of our new classics made with locally sourced ingredients. Try our farm fresh eggs from Seibel’s Family Farm and coffee roasted just down the street from KLVN. You’re Interested in using Nancy’s Revival for catering for your next event. You Want to find out more about our business, mission and/or employment. You want to become one of our suppliers or provide a service for us.